Electronic Arts today announced that FIFA 16 Ultimate Team is now available as a free download on the App Store and Google Play. 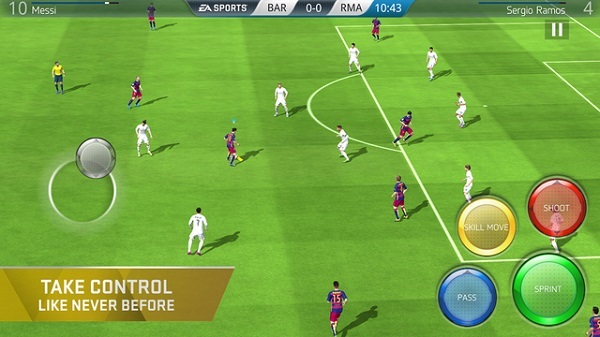 The new FIFA for mobile features console-quality gameplay, easy to learn hybrid touch controls, and brand new ways for fans to build their Ultimate Team. Today also marks the release of the New Season update for FIFA 15 Ultimate Team. The previous year's title now features new player items and a redesigned user interface. FIFA 15 Ultimate Team New Season is a great alternative for fans whose devices are not powerful enough to run FIFA 16 Ultimate Team's new gameplay engine. Gameplay is at the forefront of innovation in FIFA 16 Ultimate Team. Powered by the third generation gameplay engine, the players now look, move and behave more like their real world counterparts. The engine's highly sophisticated A.I. ensures that the computer controlled players make smarter decisions on both ends of the pitch, making it easier for players to immerse themselves in the action. The improvements extend to the player likenesses with updated 3D head scans and new character models that bring players to life on mobile like never before. Fans can now also fully express themselves with new skill moves and, for the first time ever on mobile, player celebrations. Complementing the innovation in gameplay are the new, fully hybrid, gesture and touch controls which give players more options while keeping the game simple and fun to play. The innovation continues in Ultimate Team, the mode where fans earn, buy and sell the world's top real players on their way to building their dream team. Player Exchange, a brand new feature in FIFA 16 Ultimate Team, offers fans a fun and exciting new way to get the players they really want. Fans can now go to the Player Exchange hub and offer players they already have in exchange for random new players. The higher the quality of items offered by the player, the higher the chance of getting great items in return. Also new to Ultimate Team on mobile is Accomplishments, a feature that keeps fans engaged with limited time challenges and offers great rewards for reaching game inspired milestones. And now fans will be able to manage their squads easier than ever before, thanks to the ability to buy consumables directly from the Shop, and the removal of player contracts.